Rev. 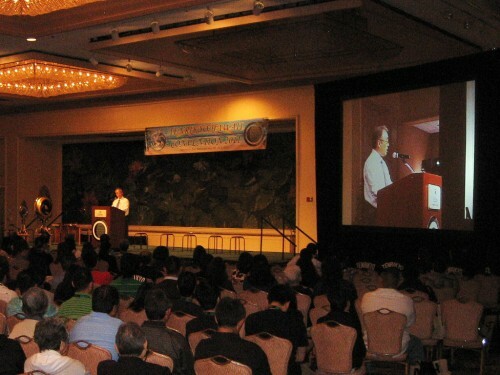 Colin Saito presenting at the Tenrikyo Hawaii Convention 2011. Rev. Colin Saito had stopped by the other day and passionately explained his understanding of the Yorozuyo to myself and a few others, and described the true love of Oyasama for everyone in this world in teaching us the Service. Indeed he was very inspired to spread his words to others. So I asked if he could allow me to put his speech that he did for the Tenrikyo Hawaii Convention 2011 in the “Study of the Service” section. He had kindly allowed me to do so. Just as I remembered at the Convention, I felt like I could feel the importance of the Service through his voice and action. It was definitely inspiring and appropriate to be put on to this website. “ALOHA!” And WELCOME to The Tenrikyo Hawai’i Convention 2011! And for our friends who traveled long distances from overseas, welcome to the State of Hawai’i. This event is history in the making! It is the first time a convention of this sort is being held outside of Tenri. Congratulations, for making the sincere decision to be here and make this a wonderful success! We just saw a wonderful video on the ‘Importance of the Service’ and although the details of the Kagura Service itself were not touched upon, it did give us a feeling of hope and inspiration for the sake of world salvation. In the allotted time, it is impossible to explain the fundamentals of the Service around the Kanrodai Stand that marks the Jiba of Origin, the original place where human beings were first conceived by God the Parent. Although we may never be Service Performers at the Jiba, it is absolutely necessary to study the Ten Aspects of the Complete Providence and be able to comprehend the meaning of the Kagura masks and the hand gestures of the Ten Service Performers, because the same principle applies to the Service that we do at our respective churches. Further study will bring a sincere sense of understanding that this Service must be done with an attitude and mind of joy, so that the goal of UNIVERSAL SALVATION can be accomplished for every single child of God, Our Beloved Parent! This Service is a re-enactment in principle of the divine powers used by God the Parent in the creation of this universe, this world, and us human beings! Through this Service, we can change our destiny and the fate of the world. But what is the meaning of this last verse? How do we unite our minds and do the Service correctly so that the world will settle? Can we ‘unite our minds’ while singing in another language no matter whether we have complete understanding or just partial understanding? Can we ‘unite our minds’ just by memorizing the words and the hand movements to perfection? What does ‘do the Service correctly’ mean? Does it mean simply to not make any mistakes in singing the words or doing the gestures or playing the instruments? As a local born English-speaking person, I think there is one more important factor to doing the Service correctly, and that is, we need to have a profound understanding of the teachings. And these Teachings of Tenrikyo are extremely profound…much more profound and much more deep than you may think! These are the Teachings that God the Parent has wanted to convey to us for a very, very long time over the many, many millenniums and the opportunity finally came on October 26, 1838 when Oyasama became the Shrine of Tsukihi (God). Since that time, Oyasama strived for 50 years, half of it in severe poverty while being ridiculed and slandered, to convey the Teachings to us children through Her spoken word, Her written word, and Her divine examples of demonstrating it in Her own life. no one will be your match, whoever one may be. Doesn’t this sound very promising? Oyasama is encouraging us to ponder and dig up the truth of the world so that, with a profound understanding of the Teachings, no one will be your match! Question: How many of you have returned home to the Jiba and experienced doing the Service around the Kanrodai? Good, I am glad the majority of us have had this profound experience. And I am quite sure, that after about five minutes, each of you have thought, “Wow, I wonder what the Shinbashira could be saying?” After a long five minutes of prayer…the Service begins. You start to sing with all your heart and the Shinden resonates with the sound of everyone singing around you. It is sung in Japanese, but nevertheless, the feeling is good and it moves your spirit! You feel enlightened spiritually. At the Jiba, it is easy for us to be swept off our feet and feel that wonderful feeling from doing the Service. Unfortunately, after we return to our respective homes and countries, we all know how difficult it is to keep this elated feeling. Right? Is there a special formula or trick to keeping that wonderful feeling of doing the Service at the Jiba? For me personally, I try to visualize the Kanrodai scene before I start the Service and it kind of helps to bring back some of that nostalgic feeling. But that alone is not enough to nurture a desire to do the Service with sincere intent of praying selflessly for all people in the world. Question: How many of you are proud to be Tenrikyo? Question: How many times do you think you have been reborn? The Truth of Origin says we “were reborn 8,008 times as worms, birds, beasts and the like.” What dinosaur were you? Exactly how many lifetimes in the so-called “human form,” we may not be sure, but don’t you think there is a great possibility that you have lived many, many lifetimes? And as Tenrikyo is only in its 174th Year, I would presume that most of us have already experienced the various religions and teachings throughout the world, and maybe even spent lifetimes following the beliefs of the Pigmies in the rain forests or the indigenous Indians of the Great Plains. Or maybe you lived a secluded life of monk in a cave and another life as an Atheist. The point is, after being reborn repeatedly and experiencing some of the nine-tenths of God’s teachings already given to us throughout the world, in God’s eyes, you were deemed “spiritually ready” and therefore, you were reborn in this life to come across these WONDERFUL TEACHINGS. Your soul is ready to learn the final part of God’s teachings. You should be proud to be given this opportunity…this privilege, to have an encounter with Oyasama and the teachings of Tenrikyo. YOU ARE READY! Now, do you feel a greater sense of PRIDE AND RESPONSIBILITY? Good! Presently, aside from the Korean language, the Service is sung in Japanese. I know there are two schools of thought on this, one for leaving the Mikagura-uta un-touched and the other for translating it into a singable-danceable English version. I have been singing it in Japanese all my life and my first priority is to try my best to remember the Japanese words and then the hand movements and the foot movements, which leaves very little time for comprehension of the meanings. In 1867, Oyasama composed the Twelve Songs for the Teodori. Two years later in 1869, She wrote Ofudesaki Parts I and II, and the next year, in 1870, She composed the Yorozuyo using the first eight verses of Part I of the Ofudesaki. The Yorozuyo contains the gist of God the Parent’s’ Intention with a very important message for us, and so, Oyasama instructed that it be placed in the beginning, as the “Prelude” to the Songs for the Service. I want to share an exciting insight I only recently gained. Although people may say that this is only human interpretation, as I am human, I have no excuse to that, but after all these years of searching, it feels good to have come across this wonderful inspiration. Through the following interpretation of the Yorozuyo, I would like to explain how comprehension of the verses could be enhanced to bring out deeper and more profound meanings. The word “world” (sekai) appears 13 times in the Mikagura-uta but Oyasama used 4 different gestures to express its meaning. One was the “Standing Fans” (Song Three, verse 3) to depict people of the world coming to the Jiba (sekai ga yori ote). Another gesture was the “Turn Around” (Song Eight, verse 3) to signify all people coming from around the world (sekai kara). Eight times Oyasama used the “Lift Up” gesture (isami no te) to depict the goal of the Joyous Life world. And so, by paying attention to the accompanying gesture, you can sort of get the feel and understanding of that verse in question. The final gesture is the “World” gesture and it appears in the Yorozuyo in stanzas 1, 7, and 8, with all three being the same. This gesture begins with the left index finger pointing upwards and then moving the left hand laterally a quarter turn to the left. What could such a gesture mean in depicting the word “world”? In December of 2009, Rev. 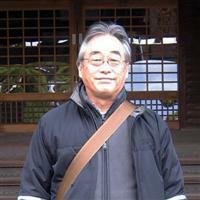 Yoichiro Miyamori was in Hawai’i and I asked him about the meaning of the gesture for “world” in Yorozuyo. He replied that he never thought about it and that he would inquire. To my surprise, he ended up asking over 20 people and one of them was my wife’s uncle, Rev. Yoshiharu Nakayama. Those two pondered for three days and then while walking down the corridor of the Shinden, Rev. Nakayama suddenly got an inspiration. He said, “That’s it! The “Yorozuyo no” (show the “Wave gesture) depicted by the three “Waves” gesture, represents a vertical timeline from the beginning of the universe to the time Oyasama became the Shrine of Tsukihi. To think that Oyasama put such a tremendous amount of time, to be represented by just three short “wave” gestures, is hard to comprehend. But, this may be a valuable insight into the boundless heart of God the Parent, Who exerted such tremendous effort into the Creation of this universe, this world and us human beings, and yet, simplified it all into just three short movements. Why is God bypassing such a tremendous amount of time and effort? The creation process is such a majestic feat, quite incomprehensible to us human beings—the billions of years of stellar and planetary formations including our earth—and also, when compared to the rest, the rather short period of human evolution and history until 1838. But, despite the tremendous amount of time and effort, due to the warm Parental Heart of God, we were taught to use only the “Waves” gesture to represent this entire vertical timeline! Please keep this in mind, because I will connect this to one more part in the Yorozuyo later! The next word in stanza 1 is “world” (sekai), depicted by the fourth type of gesture. Rev. Nakayama explained that the left index finger pointing up could be Oyasama, through Whom God will teach something very important. And the lateral movement to the left represents the horizon of this earth, meaning here on this earth plane, and the leftward movement means from now on. There is only one other place in the Mikagura-uta that we move to the left and that is for the very important “lean on God” concept also depicted by a very unique gesture. The “World” gesture appears three times and is unique to the Yorozuyo, therefore, I truly believe that there is a clear intent to depict a very special meaning! In stanza 2, it begins with the “High Throw” gesture and there are only two times this unique gesture is used and both are found here in the Yorozuyo, stanza 2 and 5. In stanza 2, the “High Throw” gesture depicts “so should it be” (sono hazu ya) with ‘it’ having reference to the fact that human beings do not know the important thing, the Truth of Origin, that God has yet to teach us. In stanzas 3 and 4, we are taught that God the Parent appeared personally to teach all things in full detail and talks about the Jiba and its origin of which we humans do not yet know. In stanza 5, the second of the two “High Throw” gestures unique to Yorozuyo, is used to depict “this origin” (kono moto o) once again referring to the Truth of Origin, through which we will learn of the PURPOSE and GOAL of human Creation and thus, begin to yearn for our roots. In stanza 6, the message is quite clear. The desire to listen (kikitaku ba) must originate from us and with that intent to learn, we should then inquire to God (tazune kuru nara) and God will then teach us about the origin of any and everything. But the intent must first originate from our own minds. This interpretation came to me in March of 2010. With the newfound meaning for the “World” gesture of “through Oyasama, on this earth, My children who know the Truth of Origin,” along with other newfound interpretations, the FEELING of the Yorozuyo was totally transformed in my heart and my eyes were often filled with tears of joy! Allow me to explain the “Yoshi, yoshi” at the end of the Yorozuyo. Though I have often inquired about its meaning, the answer eluded me until last year, when the “feeling of these words” came to me as we practiced the Yorozuyo during Shuyoka. Let us go back to the first stanza, to “Through all ages” (Yorozuyo no) with the “Waves” gesture representing a vertical timeline encompassing billions and billions of years. There is tremendous, Parental love in these words, “Yoshi, yoshi” at the end of the Yorozuyo! Please, try to sing it with that same feeling, otherwise, I feel we will be doing a severe injustice to the Parental Heart of God! Then in Song One, the first of the Twelve Songs for the Teodori, begins with the words, “At the New Year” (Shogatsu), which is really the opening of a New Age of Human Spirituality to begin. And the next words are “The Sazuke of Fertilizer: How remarkable it is!” So from the very first line of Song One, Oyasama is focusing on the nurturing of Yoboku, which continues throughout the Mikagura-uta! When Oyasama wrote the Songs for the Teodori in 1867, She predicted Her life to end in 1887 with the singing of the final verse in Song Twelve. When we dance the Mikagura-uta, we are dancing the Life of Oyasama and Her sincere efforts to nurture Yoboku, like you and me, to help in the building of the Joyous Life World! DO NOT SETTLE FOR MEDIOCRITY. Search deep and dig for the truth of the world. Study and come to understand the TRUTH OF ORIGIN to the depths of your mind. By attempting to understand what God is saying, it is like holding a conversation with God. The Service is a way to communicate with God the Parent. The Service is our personal connection to God and by doing the Service and living the teachings in our lives, we are creating a relationship with God Our Beloved Parent. Question: In doing the Service and praying to God the Parent, are you confident that YOUR THOUGHTS AND PRAYERS ARE HELPING TO CHANGE THE WORLD? Allow me to share some amazing information that will help you answer this question. In fact, I think this information is so mind-boggling that it will make you think very carefully about being aware of the your very thoughts and the amazing power of your mind when you are doing the Service. The universe, the body of God, has many secrets yet to be discovered and understood. I was ecstatic when I read this because the implication of these experiments supported my theory of the existence of “spiritual DNA” that I have been talking about in my sermons. The following astonishing experiments reported by Gregg Braden, proves that DNA can heal itself according to the feelings of the individual. In other words, an individual’s DNA is directly affected by that person’s feelings. In the first experiment, DNA was collected from a donor and placed in a container that measured electrical changes. The donor was put into one room and subjected to “emotional stimulation” by viewing various videos that generated different emotions in the donor such as fear, anger, happiness, and gratitude. The DNA was placed in another room. Both the donor and his DNA were monitored and as the donor exhibited emotional peaks or valleys, highs or lows, the DNA exhibited the IDENTICAL RESPONSES AT THE EXACT SAME TIME. There was no lag time, no transmission time. The DNA peaks and valleys EXACTLY MATCHED the peaks and valleys of the donor in time. They wanted to see how far they could separate the donor and DNA. They stopped testing after reaching a distance of 50 miles with still the same results: no lag time and no transmission time. The DNA and donor exhibited the exact same responses in time with no affect by distance. In the other experiment, the most pristine form of DNA, human placenta DNA, was placed in a container that measured changes in the DNA. Twenty-eight researchers were trained how to generate and FEEL various feelings and show strong emotions. One vial was given to each researcher. When the researchers FELT gratitude, love and appreciation, the DNA responded by RELAXING and the strands unwound. The strands became longer and the DNA switches remained on. When the researchers FELT anger, fear, frustration, or stress, the DNA responded by TIGHTENING UP. It became shorter and SWITCHED OFF many of our DNA codes. Then when the researchers again FELT feelings of love, joy, gratitude and appreciation, the shutdown was reversed and the DNA relaxed and the codes were switched back on again. This experiment was tested on HIV positive patients and when the patients had feelings of love, gratitude and appreciation, it INCREASED THE RESISTANCE 300,000 TIMES MORE. This power of love, gratitude and appreciation might well be the answer to help protect us from disease and viruses in the air, by keeping us strong from the inside. These experiments prove the power of your mind. Our DNA is directly affected by our thoughts and feelings…instantaneously! Oyasama said we must start with minds of joy. Now you know why! God gave us the power of thought, the power of free will, the power to make choices. Our mind, our soul is a precious gift from God the Parent. In every single moment, our thoughts are recorded into the spiritual DNA of our soul. To transfer a thought or feeling into words and then into an action is one thing, but to know that in every single moment, in every single instance, every single DNA in our body is being affected and is tracking our very progress to alter our destiny, this is truly mind boggling! With this kind of knowledge…it is impossible for us to feel unimportant. We are connected to every single DNA in our body, we are connected to each other and we are all connected to God the Parent! Now, let me ask you…is there any doubt in your mind, that YOUR THOUGHTS AND PRAYERS ARE HELPING TO CHANGE THE WORLD? Of course it is! The power of free will given to you by God the Parent is so amazing! Remember, the Law of Attraction is that, we attract what we focus on. Oyasama has taught us the same thing. Everything is a reflection of our minds. Whatever is in our minds, both good and bad, will be shown to us. If you are focused on fearing whatever may come, you are sending a strong message to the universe to send you whatever you fear. If you focus on positive feelings like love, joy, appreciation and gratitude, then the universe, which is God’s body, will respond accordingly and send to us, those very things that we see being brought into our lives. We can avoid negative things by finding something to be happy about every day, every hour, every moment…and these positive feelings will communicate that happiness to our DNA and turn on the switches of our good dormant genes and thus, change our destiny! Let me share a quote from “Conversations With God ~ Book 1” by Neale Donald Walsh (page 35). The power of one individual praying. The power of two people praying. The power of a whole mass of people praying in one consciousness, towards the Jiba and God the Parent, will have worldwide import and planetary consequences! In order to effectively do the group praying, first of all, as an individual with the gift of free will, you have the responsibility to cleanse and purify your own mind and heart. Go ahead and CLEAN, CLEAN, CLEAN! AND KEEP ON CLEANING! Ask God to sweep away our negative past and bring forth our original purity. As more negative memories blocking our spiritual progress are removed, divine inspiration and remarkable results will be seen as we combine our raised consciousness into a group effort of doing the Service at our churches. The Ten Aspects of the Complete Providence of God the Parent are the workings used in the Creation. It is the ‘Life Force’ of the universe, equivalent to the ‘Love of God,’ and it is based on the principle of complimentary opposites and can be explained down to the atomic level and is prevalent throughout our universe. The importance of the Service…every aspect of it, from the words, gestures, musical instruments, Kagura masks, Kanrodai Stand, and the Jiba, all have tremendous meaning and intent of God the Parent. We must strive with all our sincere intent to gain profound understanding of the Teachings and sincerely do the Service. There is no ‘magic’ about the Service. The Service will work miracles, depending on how we truly understand from our innermost heart, so that we will be able to nurture the correct attitude and bring out those emotions of gratitude, love and appreciation and SEND OUR PRAYERS INSTANTANEOUSLY to God the Parent, with no lag time and no transmission time! My fellow followers of this AMAZING TENRIKYO FAITH…I encourage you to do the Service. Every day, CLEAN, CLEAN, CLEAN and receive DIVINE INSPIRATION! Join me to “dig up the root” and gain profound understanding so that no one will be your match. And lastly, PLEASE BE PROUD to be given this PRIVILEGE to have an ENCOUNTER WITH OYASAMA and the TEACHINGS OF HEAVENLY TRUTH! Rev. Colin Saito is the head minister of Tenrikyo Honolulu Church in Honolulu, Hawaii, USA.